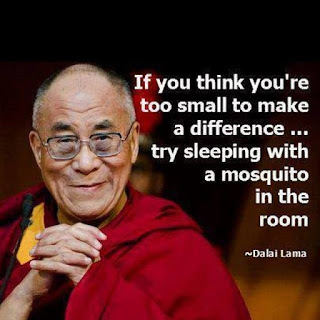 One of my favorite quotes is the Dalai Lama’s, “If you think you are too small to make a difference, try sleeping with a mosquito.” I don’t think the Dalai Lama meant that we have to be annoying. After all, the mosquito is just going about its normal everyday activities. But whether or not the mosquito is in the room makes all the difference to us. Similarly, what each of us does on our little patch of the Earth, collectively makes all the difference to our planet’s health. We don’t necessarily need to make sudden wholesale changes in our lifestyles, be less comfortable in our own castles, or add more work to our already-busy schedules.